Suhasini had worked in many films with late Vishnuvardhan but School Master will always hold a special place in her heart as the film is her last with the veteran actor who passed away in December last year. 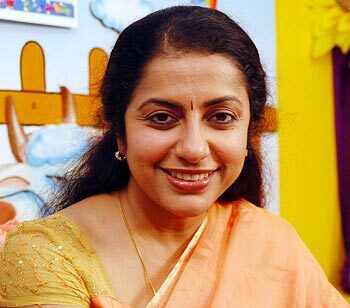 As the Kannada film awaits its release on the January 22, an emotional Suhasini Manirathnam spoke to rediff.com's R G Vijayasarathy from Tiruchirapalli where she is shooting for a Tamil film, about her favourite actor. You have worked in many films with Dr Vishnuvardhan after Bhandana directed by S V Rajendra Singh Babu. School Master, which is releasing after his death, will be the last film that features you and Vishnuji. What do you think of the film? I was so happy to work with Vishnuji. I wanted to give him tough competition as my role has lots of emotional overtones. But Vishnuji has acted so well that this will remain one of the best films of his career. Working with an actor like Vishnuji was such a great pleasure because it's such a learning experience. He would take great pains to get into the skin oif the characters. I learnt so much from him, especially while working in Mathaad Mathaad Mallige. There are many unforgettable moments that I would always cherish while working with him like the way he handled the comedy sequences in a film like Hendthige Helthini, or his super cool reactions in Mathaad Mathaad Mallige . I was very happy when Dinesh Babu narrated the story of School Master to me as it meant working with Vishnuji again. I am sure School Master will be appreciated as an intense and message oriented film with a classic performance from Vishnuji. Yes, I know. I remember one particular sequence where he was supposed to console me. Both of us were sitting on a bench. I had to weep first and Vishnuji was supposed to console me. I was amazed when he started speaking his lines. I was so overwhelmed with his performance that I just wanted to touch his feet after the completion of the sequence. But instead Vishnuji patted my back saying that he appreciated my performance. I was surprised and checked to see if he was kidding like he always was. But later the film's director, Dinesh Baboo sir, also said the our performance was perfect. There were many scenes where I thought Vishnuji completely dominated me. But later Vishnuji would compliment me on my perfect performance. He said his performance was heightened only when he got perfect reactions from his co-artists. Later when I started dubbing for the film, I realized why Vishnuji praised me. Are there any funny moments you remember happened during the course of shooting? On the first day of my shoot for School Master, I was feeling a little uneasy because I had to travel a lot. I was feeling a little sleepy too. After the completion of each shot, I would go for a small nap. Vishnuji observed this. In the afternoon, when we were shooting an important scene, Vishnuji told Dinesh Baboo that I was the luckiest artist in the film industry. I was little surprised and asked him why. He replied, "You are being paid to sleep on the sets. The producer is really such a nice person," he said. All of us started laughing. Vishnuji was like that. He would crack jokes all the time while shooting with me. A few months ago, he came to my house in Chennai along with his wife Bharathi. We had dinner together. He liked the Puliyogare (tamarind rice) and Sakkare Pongal (sweet delicacy) made in the Iyengar households very much and asked me to pack some for him. I did as he asked but he chided me for giving him very little. 'Why didn't you pack this in a stainless steel carrier which has a larger space and could have accommodated a little more Puliyogare,' he asked me. That was Vishnuji. What are the other incidents that you would like to remember? Well, there are many. Vishnuji was very reserved with people he has just met. When I started working with him, I thought he was very reserved and would speak only when he felt like. But once he understood the other person, he would speak all the time. I was very close to him and would visit him in Bangalore whenever I had the chance. He too would come to my house in Chennai whenever he could. In fact, on August 9 last year, a few artists including me had taken the lead to organise a function in Chennai for the reunification of all the artists who have entered the industry in the seventies and eighties. It was the brain child of Radhika Sharath Kumar and Lizy Priyadharshan, but all of us joined them. Vishnuji and his wife had come to the function which was also attended by Rajni sir (Rajnikanth) and many others. We tied friendship bands on all those who had come to the function. I also tied the friendship band on every other artist, but somehow did not feel like tying it on Vishnji and Bharathiji. I fell at their feet at the function as that was how I felt about them. You must have seen him turning to spirituality in the last few years. How did you feel about the change? I saw him moving towards spirituality gradually. And he looked perfectly natural with those changes. He had acquired abundant knowledge about many things as he was a voracious reader and interacted with many people. He not only had saintly looks, but would also behave like a saint. At the same time, he was very committed to his profession and he was really a lion in front of the camera. He was compassionate to all the workers. In many instances I had found him arguing for the workers with many people. Again, that was Vishnuji who was concerned with all the people working with him.